Shey-Phoksundo National Park has Nepal’s greatest population of snow leopards. With twenty-one local schools participating in the Dolpa Junior Ranger program, and ten in the new Mugu program, the next generation of snow leopard stewards is learning about the cats’ place in the high-altitude ecosystem, what a national park is and why we need them, how to calculate the percentage of Nepal’s total land that is officially protected, and what children themselves can do to protect their environment. 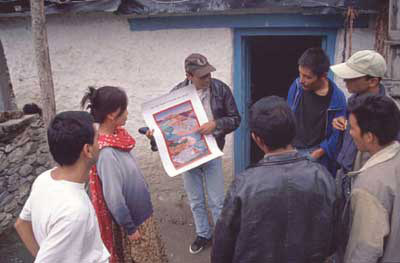 The Snow Leopard Conservancy’s Good Livestock Management poster, the Ramailo Kitaab books, and group activities are used to teach students about the animals found in the park. Two classroom sessions are devoted entirely to learning about snow leopards. We are partnering in this effort with the Dunai Boarding School, and the Rural Community Development Center, Mugu. Read about a field visit by Darla Hillard and Nagendra Budhathoki (pdf – 116 kb).